A primer to Sichuan cuisine I wrote for Anthony Bourdain's Parts Unknown website. In China, Sichuan food is known for its complex and sophisticated canon of tastes, but much of it has never made its way over to the West, where it’s invariably known for only a few dishes and face-numbing heat and spice, which grossly underestimates the cuisine. Chengdu sits in the Sichuan basin, which is flanked by mountains on all sides and the vast Qinghai-Tibet plateau to the west, making it so difficult to reach that the Tang Dynasty poet Li Bai described getting there as “more difficult than the road to heaven.” But its fertile plains lured many onto the journey, and dynastic upheavals over the last few thousand years have drawn continuous waves of immigrants into the province. Each wave brought along its own culinary and cultural customs, making Sichuan food one of the original fusion cuisines. For thousands of years, Sichuan was known as “the land of plenty” (天府之国 tianfuzhiguo). Its warm, wet climate and fertile plains created agricultural abundance, which was increased in the third century B.C. with the completion of the massive and sophisticated Dujiangyan Irrigation Project, harnessing the power of Sichuan’s many rivers. Located along the Silk Road and Tea Horse Road, major trade routes to the West, Sichuan also absorbed many outside influences into its culture and culinary practices, most notably the adoption of chili peppers from South America and cooking techniques from northern and eastern parts of China. Sichuan people’s love of spice can be attributed to the region’s muggy climate. According to principles of traditional Chinese medicine, dampness creates imbalance in the body and must be driven out by eating foods that are “heating” in nature. In the early days, the heat came not from chilies but from a combination of ginger, Sichuan pepper, and cornel berries, the ruby red fruit of the cornus mas plant. These aromatics comprise the 辛辣 xin la, or pungent spice flavor, that is valued by Sichuan chefs over pure, fiery heat. 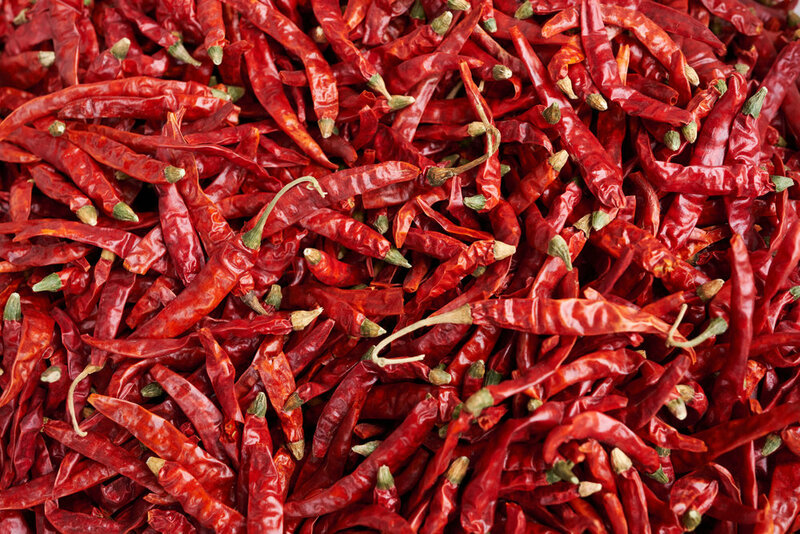 It wasn’t until the 16th century that chili peppers arrived in coastal China via maritime trade routes, and centuries later that they were cultivated in Sichuan. Locals adopted chilies as they discovered their perfect harmony with the aromatic numb of Sichuan pepper, and they became an integral part of the cuisine. Not all of the region’s flavor profiles are spicy. Sichuan chefs are famous for combining a limited number of ingredients to form at least 24 compound flavors known as fu he wei. Of these, only about seven feature the spiciness famously associated with Sichuan cuisine. Lesser known but just as iconic, 椒盐味型 jiaoyanweixing (salt–and–Sichuan pepper flavor) is a deceptively simple combination of roasted ground Sichuan pepper and salt but is inventively applied on everything from fried chicken to freshly baked butter cookies. “Lychee flavor” has no lychees in it but combines sweet and sour notes in imitation of the fruit and is applied to a savory canvas like fried pork over rice. What unifies all of 24 flavors is a complex 鲜 xian(umami) quality that doesn’t overshadow the natural taste of raw ingredients but delicately draws out their essence. An ancient Chinese spice that has been cultivated in Sichuan for thousands of years, huajiao (Sichuan pepper) is responsible for the cuisine’s famous tongue-tingling sensation. Some believe its use in Sichuan cooking is to numb the senses enough to allow one to eat even more chilies. Huajiao is actually the seed of a tree in the citrus family and isn’t related to the common peppercorn. There are dozens of varieties of in China, but the most famous is grown in Qingxi village, along the mountainous Tea Horse Road, an ancient trading route dedicated to the transport of tea and spices from China to the West. The small village produces a variety called 贡椒 gongjiao (tribute pepper), so prized for its many medicinal and culinary uses that it was offered in tribute to the emperor. The delicate kernels are painstakingly hand-harvested every August in small quantities and sell out almost immediately. Thrown whole into long braises and stews or roasted and ground to top iconic dishes like mapo tofu and twice-cooked pork, just-harvested gongjiao can be transformational. No discussion about food in Sichuan can ignore the 苍蝇馆子 (fly restaurant), an iconic fixture of Chengdu that has come to embody the very soul of Sichuan cooking. The name is given to hole-in-the-wall restaurants that are old and run-down, but so delicious they still attract people like flies. The prerequisites for a fly restaurant are 1. an impossible-to-find location down alleys and around corners; 2. walls streaked with years of blackened grease; 3. zero advertising or atmosphere; and most important, 5. incredible flavors. Each restaurant has its own signature dishes that have been passed down and honed and over generations. Fly restaurants are some of the few places where luxury cars are parked next to old bicycles and where, for a brief moment, everybody hunkers down at the same tables, pressed back to back with their neighbors, united in the common pursuit of a delicious meal. Even before fly restaurants, there were vendors hawking tasty and inventive snacks on the bustling streets of Chengdu. In the late-19th to early-20th century, the buzz of commerce filled the air, and enterprising merchants created what is now Sichuan’s famously diverse canon of street food: steamed buns, wontons, freshly made soft tofu drizzled with chili oil and pickles, hand-pulled noodles, and so many others, all sold on mobile carts or in baskets, slung on bamboo poles over the shoulder. Many in my parents’ and grandparents’ generation remember those days as the golden era of street food. Competition was fierce, and excellence was requisite. The winds of change swept through when “capitalist” vendors were driven off the streets during the Cultural Revolution, and their goods eventually disappeared. These days a lot of the more famous snacks can still be found in state-owned restaurants, which offer a sampling of every dish in a set menu; but the flavors are usually abysmal compared to their former glory. Great snack stalls still exist but just need more sleuthing to be found. A place that my mother went to as a child still serves the same thick, chewy strands of 甜水面tianshuimian (sweet-water noodle), bathed in an elixir of chili oil, sweet soy, garlic, and sesame paste. A wooden cart with no name parked by a red-brick wall outside an elementary school still serves the same light and fluffy egg pancake, called 蛋烘糕 danhonggao, stuffed with spicy stewed pork and pickled radish. A stall on a busy street corner still kneads bits of ground pork spiced with huajiao and salt into flaky, chewy dough; the dough is pressed into a flatbread called 锅盔 guokui, which is then fried to a golden crisp on a griddle. More than just Sichuan’s favorite dish, hot pot is a way of life. Locals eat hot pot at least once a week. Either at restaurants or at home with family and friends, they sit around a bubbling pot of soup teeming with chili peppers, lard, and spices. The difference between Sichuan hot pot and versions from other parts of China is that the flavor is in the pot rather than the dipping sauce. The soup base is a complex layering of flavors built upon a base of rich beef tallow, fermented fava-bean paste, and chili oil, and up to a dozen spices and herbs thrown in as well. The result is a red-hot cauldron of flavor for cooking an enormous variety of ingredients, with only sesame oil, raw garlic, and a sprinkling of MSG used as a dipping sauce. Eating hot pot is a social event, and it’s a marathon rather than a sprint. It’s not uncommon for gatherings to graze languidly over the pot for hours, at which point the last remaining morsels in the pot can be terrifyingly spicy—to the point of hallucination. In the early 20th century some restaurateurs, hoping to keep customers coming back for more, heightened these physical sensations still further with the (now illegal) addition of opium in the broth. In recent years innovations in hot pot have spurned trends like 麻辣烫 malatang and 串串香 chuanchuanxiang, both variations of meat and vegetables skewered on bamboo sticks, cooked in spicy broth, and dipped in ground chili and sesame. The skewers can be served hot or, increasingly popular in summer months, cold, as 冷锅串串 lengguochuanchuan. Another frequent sight on the streets of Sichuan are storefronts with wide windows, displaying caramel-colored poultry hanging from the ceiling and trays of stewed aromatic meats along with innards, tongues, ears, and tails. An essential part of the culinary lexicon, 卤菜 lucai is a mainstay of Sichuan homestyle cooking. They serve as banquet centerpieces and as cold appetizers before a meal. Meats are slow-cooked until tender in a rich and flavorful broth that has been seasoned with over 10 different spices, including cardamom, dried ginger, chili, and traditional medicinal herbs. The meats are then sliced and served at room temperature. Old shops claim that the secret to their aromatic broths is years of adding to and replenishing their soup bases. A cross between the tradition of lucai and hot pot has recently produced the 冒菜 maocai craze. Now a popular street food, maocai consists of a choice of meat or vegetables, cooked in a broth heavy with aromatics and medicinal herbs, then dressed in a chili sauce or dipped in a mixture of dry chili and spices. Pickled vegetables are fundamental to Sichuan cooking and, eaten along with rice, are arguably the most important part of a meal. The pride of every household is its collection of 泡菜坛子 paocaitanzi, handmade earthenware urns with a trough around the neck that acts as a water seal for the lid. The dark environment within fosters the perfect conditions for lacto-fermentation; vegetables emerge from the urns naturally crunchy and acidic, distinctly flavored with Sichuan rice wine, ginger, cassia bark, star anise, huajiao, and chili. Like lushui broth, pickling brine can be decades old, passed down by the matriarchs of the family, each generation adding its own signature to the flavor. Different crocks serve different purposes, some holding “old pickles” like the long-fermented mustard leaves used in the broth for 酸菜鱼 suancaiyu (pickled-vegetable fish). Others are expressly used for pickles to be left in the crock just overnight; such vegetables have a high water content, like cucumbers, celtuce, and small radishes, giving them the name “shower pickles.” Often served for free as an appetizer, it’s not uncommon to judge a restaurant based on the quality of its pickles or a household on the cleanliness of its crock. Despite the simple ingredients and process, consistently perfect pickles are remarkably difficult to produce. Some claim that only the water and climate in Sichuan produce the right conditions for pickling; others say that some people’s hands are ill suited to the craft and will spoil them every time. Like much else in Sichuan’s food culture, pickling is an art and tradition that is steadfastly preserved, protected, and celebrated. As the Chinese saying goes, 民以食为天 minyishiweitian, “to the people, food is heaven”.